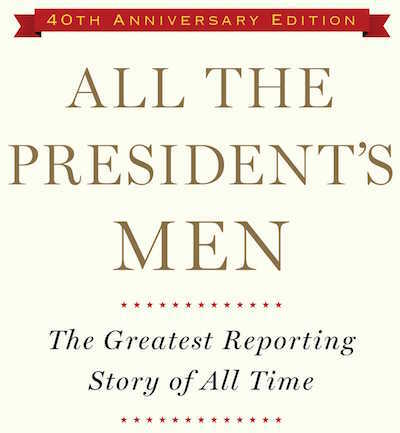 The fortieth anniversary edition of All The President's Men includes an afterword (originally published in The Washington Post) discussing President Richard Nixon's legacy: "Nixon launched and managed five successive and overlapping wars - against the anti-Vietnam War movement, the news media, the Democrats, the justice system, and, finally, against history itself. All reflected a mindset and a pattern of behavior that were uniquely and pervasively Nixon's: a willingness to disregard the law for political advantage, and a quest for dirt and secrets about his opponents as an organizing principle of his presidency." In 1972, Nixon's 'White House plumbers' broke into the Democratic National Committee's Washington headquarters in the Watergate building. Bob Woodward and Carl Bernstein's coverage of the Watergate scandal remains arguably the most significant story in the history of journalism, as it ultimately led to Nixon's resignation. Nixon insisted "I am not a crook" (at a press conference on 17th November 1973), though he resigned in a live broadcast on 8th August 1974: "because of the Watergate matter I might not have the support of the Congress that I would consider necessary to back the very difficult decisions and carry out the duties of this office in the way the interests of the nation would require... Therefore, I shall resign the Presidency effective at noon tomorrow."